The government’s ‘roadmap’ for a recovery-based treatment system has rung alarm bells with many respected organisations in the field, despite its declared principles of ‘wellbeing, citizenship and freedom from dependence’ (news focus, page 6). Opposition goes beyond drug and alcohol treatment to those working in wider public healthcare settings. There is deep-seated worry for clients unable or unsuited to reaching the abstinence goal and those for whom stigma has already provided hurdle after hurdle to the healthcare that the rest of the population takes for granted. These criticisms are not made lightly and we can only hope the government listens to criticism of a ‘dangerous’ policy whose ‘impact will be measured in lives lost’. Another expert commentator features in our cover story (page 8). 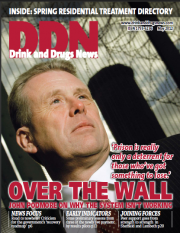 John Podmore’s 25 years as a prison governor and inspector make him a qualified voice on why our prisons aren’t working – particularly for those who fall victim of the remand system, a cruel way of dealing with drug, alcohol or mental health problems. His aim in writing the book was to stimulate debate and provoke change. Let’s hope he gets a hearing. And in the middle of a packed issue, we hope you find our centre-page pullout residential treatment directory useful. You can also find it online at here with our other free resources. There’s been strong opposition to the government’s ‘roadmap’ for recovery. DDN reports. John Podmore spent 25 years as a prison governor and inspector. He tells David Gilliver why the system isn’t working, particularly for people with drug and alcohol problems. The government’s PbR pilots are now up and running. DDN hears how things are going so far. Haringey services and clients are working together to reduce stigma, says Laura Pechey. Maureen Roberts experienced prejudice on top of grief when she lost her son. Her story underlines the need for appropriate family support. Carl Cundall explains how a peer-led recovery service can be a beacon of good practice. Our guide to the UK’s residential services.